Undergraduates who identify as gay, lesbian, bisexual or queer switch to non-science degrees at higher rates than their heterosexual peers. 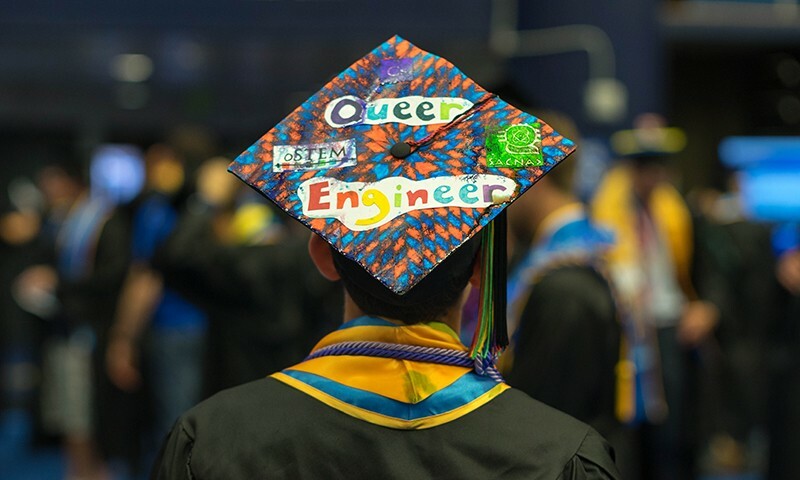 As a PhD student in education, Bryce Hughes wondered whether being gay was part of the reason why he never pursued engineering beyond his undergraduate degree. Perhaps, he thought, students who identify as gay, lesbian, bisexual, transgender or queer were more likely than heterosexuals to abandon science studies. Now he knows: students from sexual minorities are leaving science, technology, engineering and math (STEM) degrees at higher rates than their heterosexual classmates. The findings1, published in Science Advances on 14 March, provide the first direct evidence that lesbian, gay, bisexual and queer (LGBQ) students are leaking out of the scientific pipeline. Social scientists “suspected it, but it’s nice to see it documented”, says Erin Cech, a sociologist at the University of Michigan in Ann Arbor. The study focused on students’ sexual identity, so Hughes did not specifically look at transgender or gender-non-conforming students. Hughes, now an education researcher at Montana State University in Bozeman, used information from a national survey given to university students in their first and last years in school. The questionnaire collects information on students' demographics and career goals, among other topics. Hughes analysed data from more than 4,000 freshmen university students at 78 US institutions in 2011, and compared their responses to those they gave to the survey when they were seniors in 2015. He wanted to determine whether first-year LGBQ students who aspired to pursue a STEM major were still enrolled in such a major by their fourth year of university, or whether they had switched to a non-STEM programme. By their senior year, nearly 50% of LGBQ undergraduates reported working in a laboratory or doing fieldwork, compared with 41% of heterosexual students. But they were 8% less likely than their heterosexual peers to stay in their STEM degree, Hughes found. The gap reached nearly 10% when he looked at the subset of students who were more likely to stay in a STEM field, for example because they had good grades or had a parent who was employed in science or engineering. “These students are no less enthusiastic than their peers about pursuing a STEM career,” says Michael Falk, a material scientist and vice-dean for undergraduate education at John Hopkins University in Baltimore, Maryland. But the fact that LGBQ students are less likely to continue in STEM programmes raises more questions than it answers, Falk says, and the issue will be difficult to understand without talking to the students about their stories. Although the study doesn’t explain why LGBQ students leave STEM majors more frequently than their heterosexual peers, it’s “highly likely” that marginalization and isolation play a part, says Falk, who in 2016 contributed to a report that showed that one in five lesbian, gay, bisexual and transgender (LGBT) physicists in the United States faced exclusion and harassment at work because of their gender identity or sexual orientation. “Being out is a freeing thing, but finding a friendly lab or college campus is not always easy,” says Rochelle Diamond, a biologist at the California Institute of Technology in Pasadena, and chair of the National Organization of Gay and Lesbian Scientists and Technical Professionals. Hughes, B.E. Sci. Adv. 4, eaao6373 (2018).